Dimensions 1.25 by 8 by 10.25 in. Trial practice; United States; Popular works. Pro se representation; United States; Popular works. Civil procedure; United States; Popular works. Sometimes it makes sense to handle a court case without an attorney. 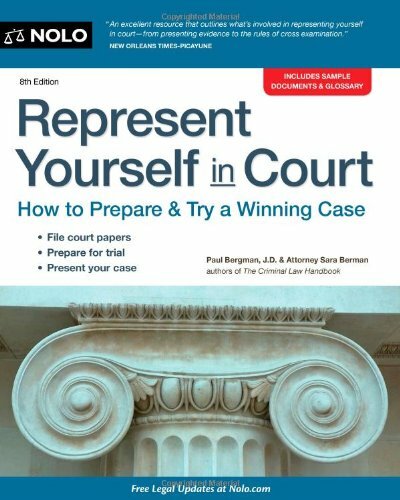 Learn about acting as your own lawyer in Nolo's easy-to-use, plain-English guide, Represent Yourself in Court. Whether you're a plaintiff or a defendant, this book will help you confidently handle a divorce, personal injury case, landlord/tenant dispute, breach of contract, small business dispute, or any other civil lawsuit. This edition has been revised with the latest rules and court procedures, and includes updated information on electronic discovery rules and fax filing procedures. Plus, you'll get enhanced materials on court assistance for pro per litigants and an expanded discussion of self-representation in bankruptcy court. About: How to prepare and present a winning civil court case Many disputes are too big for small claims court but too small to justify a lawyer’s fee. About: Sometimes it makes sense to handle a court case without an attorney.